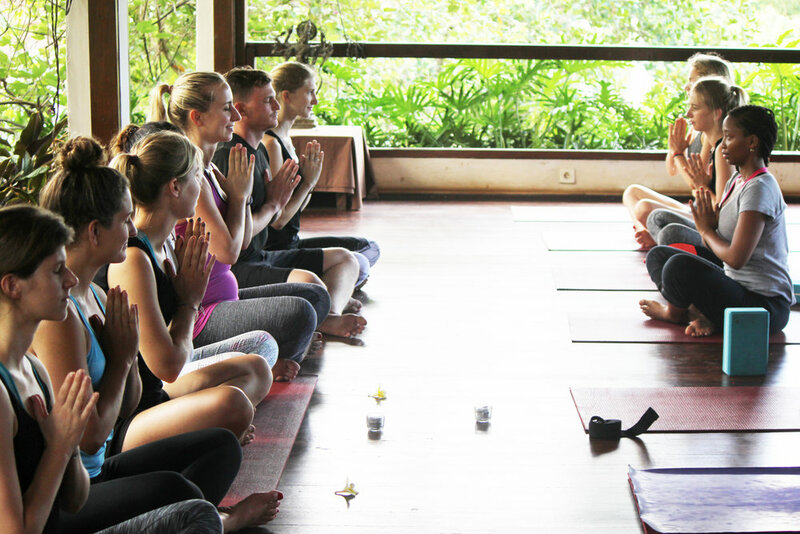 Dedicate a month to your yoga practice & nourish yourself in vibrant Ubud, Bali. Develop your teaching skills & learn to share yoga from this inner space. Early Bird Price is valid till 2nd March, 2019. ROY Students are also entitled to a 10% discount at Yoga Barn's on-site amenities - Kafe Restaurant and Kush Aryuvedic Spa. Food & accomodation is not included in this package. Students are able to choose their own accomodation depending on personal budget and preference. Off-site accomodation : Contact us for an accomodation list of guesthouses within walking distance from our training venue. On-site accomodation : There are two on-site accomodation options at The Yoga Barn (see below). 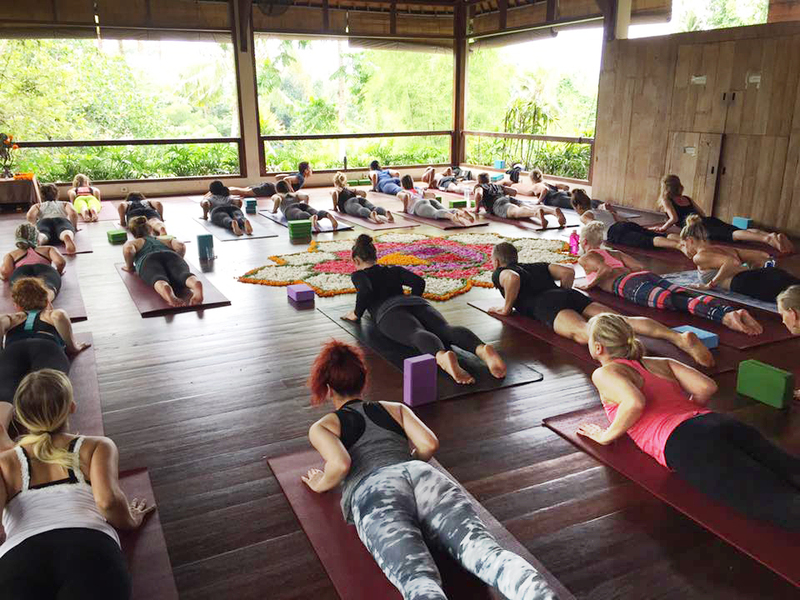 More impressions on ROY's teacher training programs at The Yoga Barn. 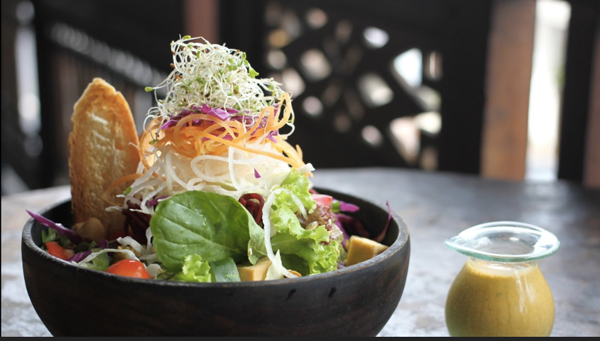 Kafe - A vegetarian and vegan garden restaurant with healing foods and local produce. Located at the edge of the Yoga Barn property YB Guesthouse has a total of 10 rooms ranging from dorm-style, superior & deluxe rooms. The Nest is Yoga Barn's freshly built accomodation huddled away from the crowd. Both room & dorms are available. Details are pending, send us an email if you would like to be notified of updates. This 200 hour yoga teacher training program is a certified by the Yoga Alliance US. Students who have successfully completed the program quality for Yoga Alliance US registration. 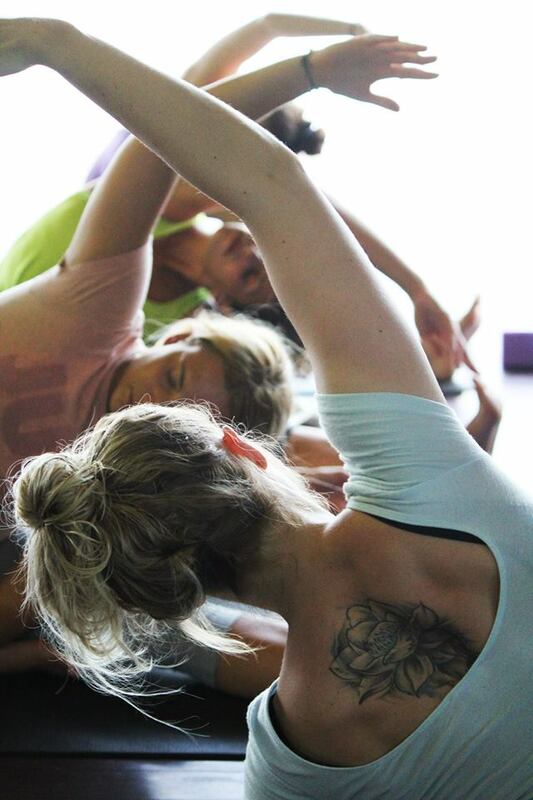 Our interest is in nurturing yoga practitioners towards their own truths. Students are encouraged to integrate an approach of healing and growth that is intelligent, efficient and honest and also forgiving at the same time. Once introspective paths are drawn they are, more importantly, systematically practiced, built upon and dialogued on. Dedicated students with a regular yoga practice (min. 1 year) looking to share their knowledge with others and/or practitioners looking to engage in an intensive period of study and practice of yoga. 1) A non-refundable deposit of $500 USD (Remainder payments will be due 2 weeks prior to course commencement). 2) OR the full course fee. Thank you for sharing your wisdom and teachings in such a humble way. While you are both so different you are also so connected and i feel you have included all of us in that connection! We were such a beautiful group and that was largely influenced by how you guided us. I am so grateful to know you both as beings and i wish you peace and happiness in life! You guys are beautiful people inside & out! Thank you for all the energy, great teachings and the love you have for life! This course helped me to grow soo much internally and my heart is so happy! I will remember you for all of my life, you are perfect teachers! I am going to miss you both so much! I had an amazing time and feel so sad that our time has come to an end - i need to practice more non-attachment! Anton I really appreciate your communication style. You are direct, concise and clear. I love your deeply seated passion & curiosity for yoga. I come from an engineering and programming background and i was worried that i'd have trouble understanding abstract concepts, so i was very grateful to have you as a teacher! Daphne you are such an inspiring person! You radiate joy, calm and life wisdom. It is impossible to be stressed when you are around! You have such an intense passion for yoga and its principals and it all comes through in a really awesome & authentic way! It was so inspiring to hear about ll your projects and causes, so cool! I'll miss you both so much. You both bring so much to the table and are absolutely incredible individuals! I learnt so much not only about yoga but also valuable life lessons. I woke up everyday excited to learn and i hope that one day i will be able to give others the confidence and courage to teach like you have done for me. This has been the most exciting journey in my life so far! From the bottom of my heart i thank you for putting the perfect course together. Don’t ever change, you are perfect! A huge thank you for this intense month of transformation! I experienced my body and spirituality in so many new ways. We have all made huge steps and i feel that you have built up our knowledge and the tools to get there day by day. Both your personalities, patience, openness, honesty & professionalism made this teacher training very special and holistic. As we say in Germany ‘ÁUF WIEDERSEHEN! !’ Thank you a thousand times for taking me further into my yoga and life journey! I started this journey at a crossroads, not knowing what i wanted to do with my life. I just knew what i didn't want to do. Training with ROY was for sure the right decision and this experience will last forever in me! I will take so much of you home - your teachings, spirit and advice. I leave Bali and my ROY family with so many fond memories & a new fire inside of me to live my life how i want to. To you both i say a BIG thank you! This has been a mind blowing and truly transformative experience! Thank you for showing me that to want to teach, I must never stop practicing and never stop learning! I can't tell you how perfect this course was for me, thank you a million times over! I was so ripe for learning & deepening my practice. This course brought many experiences and pieces of my life into one clarity which i feel will help me share more easily. I really loved how authentic the both of you are and that you each teach in your own way. You both held such a beautiful open space with a clear container. You honoured the yoga traditions but encourage us to be analytic and creative with our interpretations, which i think is a superior way of teaching. I am fired up to start sharing and teaching yoga! I can't find enough words to talk about this month of transformation! It has so much information, knowledge and practical skills and it will take a long time to digest everything. I am also so inspired to start my self practice! Daphne & Anton i am deeply grateful to you my dearest teachers! I'm leaving Bali with so many ideas on how i can be a better person! Dear Daphne and Anton, you are both amazing!!! You are both the best teachers I have ever had! Dear Daphne, you are brilliant - in the way you hold yourself, in the way you share yourself and the way you love yourself. I enjoyed every moment of being in your class, for sharing of experiential knowledge, for the pearls of wisdom & for sharing your heart. You wear your beauty so gracefully & share your depth so intuitively. The way you understand and express yoga and life is so palatable and inspiring to me. You speak my language. Thank you for being my teacher and shining so brightly! Words cannot describe how valuable this month has been for me! I am filled with gratitude & feel so lucky to have attended this course! Thank you for holding this special space & guiding all of us on this journey. We have all grown so much, i just can't wait to see where everyone takes this education!! Head onto our FAQ section or speak to us directly at info@routesofyoga.com.